The brown trout and Tetracapsuloides bryosalmonae are two animals with a close connection: that of a host and its parasite. The brown trout represents an important native species in many parts of Europe for fishing activities. Thus, declines in brown trout populations make Tetracapsuloides bryosalmonae an economic liability. Working within the University of Bern’s Faculty of Veterinary Medicine, Dr Thomas Wahli and his team focus on this unique relationship and the best ways to handle it. Closely related to salmon, the brown trout is a native European fish widely sought after in angling communities. A common parasite of the brown trout, Tetracapsuloides bryosalmonae (T. bryosalmonae), is a minute aquatic animal closely related to jellyfish. T. bryosalmonae can cause the spread of proliferative kidney disease in many freshwater fish, causing huge losses in European and North American trout populations every year. 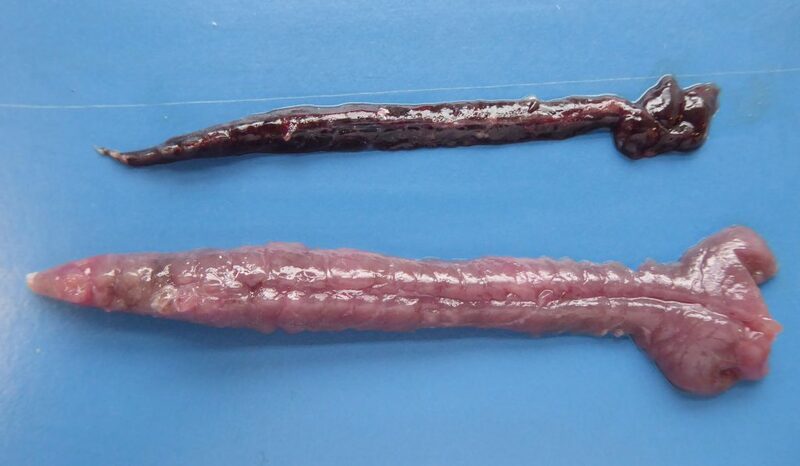 Mortality associated with this parasite is generally low (at around 20%), but often, poor environmental conditions worsen its effects and death rates can reach up to 95–100%. Proliferative kidney disease has been strongly implicated in the recent decline of wild brown trout in Switzerland. Furthermore, large European farms of non-native rainbow trout, which are also susceptible to the parasite, are heavily affected, leading to huge financial consequences. Thus, with both high environmental and economic losses at stake, any new research investigating proliferative kidney disease is highly prized. For over 30 years, Dr Thomas Wahli has been a leading figure in researching the damaging effects of fish diseases in Switzerland. He now sits as Associate Professor in the Faculty of Veterinary Medicine at Bern University, and is Deputy Head at its Centre for Fish and Wildlife Health. Dr Wahli and his team try to understand the relationships between pathogens and fish hosts in Swiss fish populations. Their aim is to develop measures to protect both wild and stocked populations. In recent years, their work has heavily revolved around understanding the brown trout (also native to Switzerland) and its precarious relationship with T. bryosalmonae. It is now well understood that human-induced climate change is a growing threat to countless species around the world. 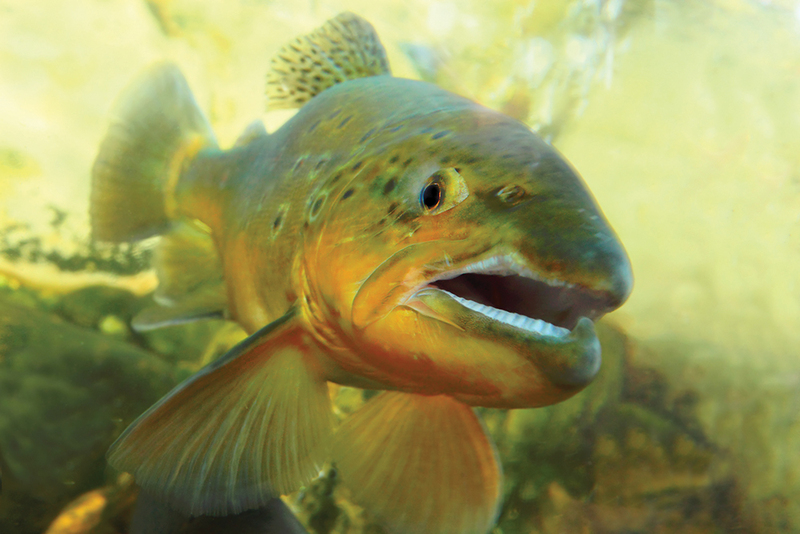 For the brown trout, the higher temperatures associated with climate change could spell greater risk of disease. As a freshwater fish, the brown trout’s immune response is correlated with heat, and so even a minor change in the temperature can lead to a significantly increased investment in immune function if infected with T. bryosalmonae. For some context, at the beginning of its life cycle, the T. bryosalmonae parasite first infects a bryozoan (invertebrate filter feeders). The affected animal subsequently releases spores, which go on to infect fish, most commonly brown trout in Europe. The parasite develops in the kidney, producing spores that are released through the trout’s urine. If these spores then come in contact with another bryozoan, the life cycle begins anew. Dr Wahli’s studies into this unique circle of life have shown that the parasitic infection occurs at a very slow rate in cold water (8–15°C), with low or no fish mortality. However, at temperatures above 15°C, the T. bryosalmonae life cycle appears to be quickened and fish mortality may rise to over 80%. To better understand what impacts climate change could have on brown trout populations – and to help minimise parasite-induced deaths in general – Dr Wahli and his team studied how different temperatures affect the spread of proliferative kidney disease. The team developed three hypotheses: (1) that temperature has an effect on a parasite’s ability to infect brown trout; (2) that temperature has an effect on the parasite’s intensity in the fish host; and (3) that temperature has an effect on the release of the parasite. To confirm or reject these hypotheses, the team infected groups of brown trout with T. bryosalmonae at 12°C and 15°C. They measured the rate of the parasite’s development by looking at the amounts of spores produced in the fish and released into the water. The researchers found that the onset of release was delayed at the lower temperature, but the amount of spores released appeared to be independent of temperature. Just as Dr Wahli’s hypotheses had stated, the elevated temperature shortened the parasite’s life cycle and increased its chances of spreading to other fish. The team’s research thus highlighted yet another negative effect that climate change and rising water temperatures could have on aquaculture and natural ecosystems. As populations of Swiss brown trout have already seen significant declines, this finding is especially pertinent towards understanding the adverse effects of climate change. While high temperatures may stimulate a parasite’s life cycle within a host, they don’t assist it during its most crucial stage: entry into the host. At this moment, the number of parasitic organisms present is the most important factor. Expanding on their previous research, Dr Wahli and his team endeavoured to understand what impact different parasite concentrations have on the spread of proliferative kidney disease in brown trout. To do this, the team exposed groups of trout to three different concentrations of parasites (high, low and multiple exposures of low concentrations). Using this experimental design, the team confirmed two of their hypotheses: the initial concentration influenced the resulting parasite concentration in the fish, leading to different degrees of kidney damage, while the onset of spore release was the same in all groups. It is important to note that during this study, the team tightly restricted the period of parasite exposure to one hour on one day for low and high concentrations, and to one hour on three consecutive days each for those undergoing multiple exposures. The infections could take place only during this period, meaning that significant rises in parasite intensity could not be due to re-exposure. In this respect, it is noteworthy that direct infection from fish to fish is not possible. Through their experiment, Dr Wahli and his team proved that a combination of high and multiple doses of T. bryosalmonae parasites significantly worsened the state of the infected fish, caused dramatic tissue damage, and slowed down the recovery time. These results highlight the impact of initial infection concentrations and demonstrate the importance of minimising contact between economically valuable trout and high concentrations of parasites. Shedding some hope onto the plight of infected fish, previous research has shown that rainbow trout that are re-exposed to T. bryosalmonae can develop partial resistance – a form of immunity that one-year-old ‘naïve fish’ lack. Wishing to know more about this potentially vital area, Dr Wahli and his team designed an experiment to test the effects of the age of brown trout on the spread of proliferative kidney disease. Prior to this work, nothing was known as to whether older fish might be more tolerant to the disease or whether the European brown trout reacted in a similar way to re-exposure. 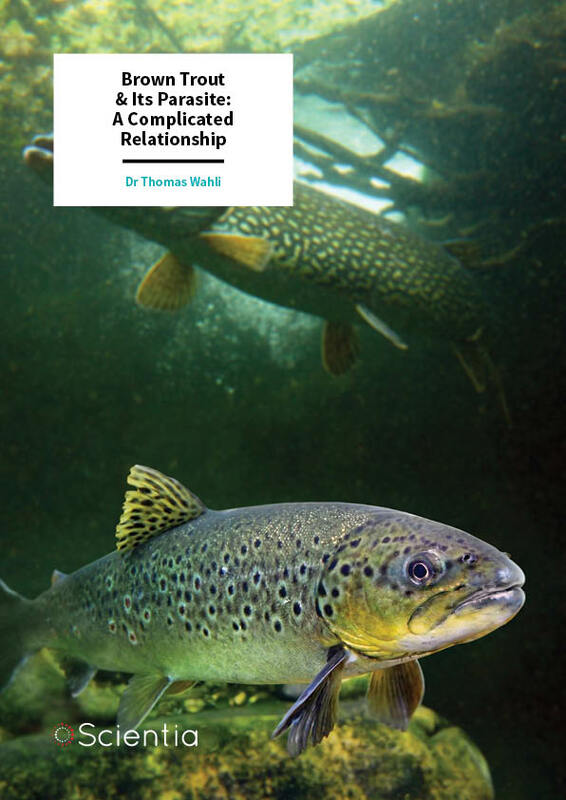 Thus, by expanding on the understanding of the field, the researchers hoped to identify new ways of managing the disease and protecting brown trout populations. By exposing the different groups of brown trout with parasites, the team found that the prevalence and parasite intensity were significantly higher in the younger fish. Older trout were still susceptible to infection by T. bryosalmonae, but at lower prevalence, and suffered less kidney damage in comparison. Just as Dr Wahli had predicted, the results of their trials where previously infected fish were exposed to parasites suggest that there might be a mechanism of resistance preventing the parasite from re-entering the fish or establishing itself in the kidneys. 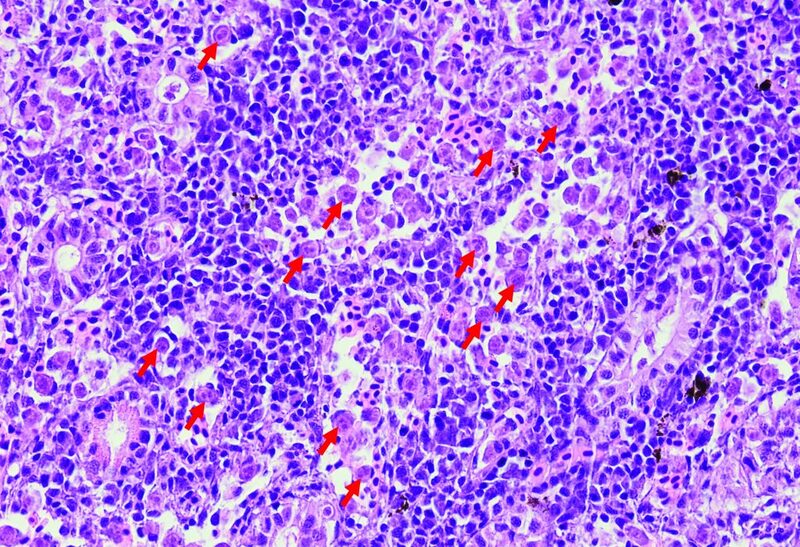 This proposed ‘acquired immunity’ mechanism still requires further investigation to prove its existence, but if accurate, the team’s research would be the among the first to shed light on the possibility of managing proliferative kidney disease in wild freshwater fish populations – a goal crucially needed when rising water temperatures are concerned. Proliferative kidney disease has been a growing threat to fish species for decades. In Switzerland, mass outbreaks of the infection have devastated the country’s brown trout populations, creating economic and environmental fallout. Thanks to the research of Dr Wahli and his colleagues, it is now clearer than ever that higher water temperatures facilitate the life cycle of the T. bryosalmonae parasite and its infection. Thus, it can be reasoned that for Switzerland and other countries home to brown trout, the fight against the disease will only intensify as the effects of human-induced climate change become more apparent. This stark warning is compounded with Dr Wahli’s other research, which has highlighted the dangers of high concentrations of the T. bryosalmonae parasite in freshwater fish populations. As T. bryosalmonae is widespread among Swiss rivers and watercourses, the team’s recent efforts further prove the present and incoming risks to native brown trout. Fortunately, Dr Wahli’s recent work showing that previously infected trout are partially protected against proliferative kidney disease reveals an avenue that could be exploited to safeguard fish populations. Demonstrating that re-exposed trout are less susceptible to infection and suffer less kidney damage than their ‘naïve’ siblings, Dr Wahli and his collaborators have given hope to the future of Switzerland’s brown trout. The team now intends to continue this research and further assess its practical possibilities in managing host pathogen interactions, disease surveillance, and fish welfare. 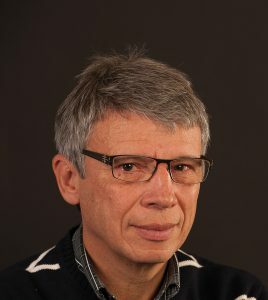 Dr Thomas Wahli received his PhD fish diseases from the University of Basel in 1985. At present, he serves as Associate Professor in the Faculty of Veterinary Medicine at the University of Bern, where he is also Deputy Head for the Centre for Fish and Wildlife Health (FIWI). For the past 20 years, he has also headed the National Fish Disease Laboratory and Reference Laboratory for notifiable Fish diseases. Over the past 10 years, Dr Wahli’s research has focused on ascertaining the effects of temperature, parasites and disease on Swiss fish populations. His current research is focused on diagnosing and counselling fish diseases, host pathogen interactions, disease surveillance, and fish welfare. At the core of his research is the goal to better understand the populations of Swiss fish in the hope of better preserving them. C Bailey, N Strepparava, T Wahli, H Segner, Exploring the immune response, tolerance and resistance in Proliferative Kidney Disease of salmonids. Developmental & Comparative Immunology, 2019, 90, 165–175. C Bailey, H Schmidt‐Posthaus, H Segner, T Wahli, N Strepparava, Are brown trout Salmo trutta fario and rainbow trout Oncorhynchus mykiss two of a kind? A comparative study of salmonids to temperature‐influenced Tetracapsuloides bryosalmonae infection, Journal of Fish Diseases, 2018, 41, 191–198. C Bailey, H Segner, T Wahli, What goes around comes around: an investigation of resistance to proliferative kidney disease in rainbow trout Oncorhynchus mykiss (Walbaum) following experimental re-exposure, Journal of Fish Diseases, 2017, 40, 1599–1612. L Carraro, L Mari, H Hartikainen, N Strepparava, T Wahli, J Jokela, M Gatto, A Rinaldo, E Bertuzzo, An epidemiological model for proliferative kidney disease in salmonid populations, Parasites & vectors, 2016, 9, 487. K Bettge, H Segner, R Burki, H Schmidt-Posthaus, T Wahli, Proliferative kidney disease (PKD) of rainbow trout: temperature-and time-related changes of Tetracapsuloides bryosalmonae DNA in the kidney, Parasitology, 2009, 136, 615–625.